A few simple way to measures to extend the life of our clothes and leave more money in wallet. Stains are one of the most common ways our clothing gets ruined. When you get a stain on your clothes it needs to be treated immediately. If you leave a stain until the day you do your laundry it has time to dry and set in and will be even harder to remove. If you wash a stained item improperly this can also set the stain in and putting a stained item in the clothes dryer is almost certain to ensure a permanent mark. Rinse out a stained item with water immediately after the stain occurs or as soon as possible. If the stain is a grease or protein stain you can treat it with a bit of dish soap. Put some laundry detergent directly onto the stain and wash it immediately in cold water. Hot and warm water can cause stains to set in so only use cold water until you are sure the stain is gone. You may need to wash the item more than once but do not dry it until you have gotten rid of the stain. If your item is a dry clean only item be sure to point out the stain to the dry cleaner when you drop it off. Shrinkage is another common killer of clothes. Clothing that is made out of natural materials like cotton and wool can shrink in the clothes dryer quite quickly. 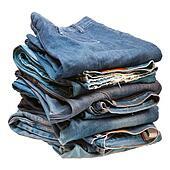 Items like denim blue jeans will shrink a bit each time you dry them. Clothes dryers can also give clothes quite a beating if you dry them too long and too often. Air-drying your clothes is the best way to make them last longer. Using a fabric softener in the rinse cycle will help keep your clothes from getting stiff. You can dry your clothes outside or on an indoor or outdoor. receive proper attention. Use dress shields to protect your clothing from underarm perspiration stains. great tip sis! our clothes wont last very long specially huubys and the kids because they are very rough with it. exacty right our kids make a mess on thir clothes they have no idea how to clean it. it's pain on the neck but we have to know how to make our clothes so it would long last.